This stylish wearable track steps, runs, swims, calories, as well as sleep quality, using a standard watch battery that provides up to 8 months of autonomy. French company Withings is not a big name when talking about fitness trackers, but its products deliver a lot to those looking for a stylish fitness tracker that does not need to be charged on a regular basis. Their latest product, known as Activité Steel, promises to deliver no less than 8 months of autonomy and uses a standard watch battery (CR2025 button cell). Withings Activité Steel tracks steps, runs, swims, calories, but it is also capable of analyzing sleep patterns. It uses Bluetooth 4.0 LE to connect to both Android and iOS devices and syncs data thanks to the freely available Health Mate app. Withings Activité Steel has a 316L stainless steel case and a silicone sport strap, being rated as water-resistant up to 165 feet. 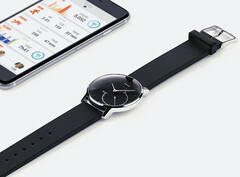 Exclusively available from Withings' website, the Activité Steel can be purchased in the US for $169.95 USD. While the US Withings online store has this wearable in stock and ready to ship, its European counterpart will only begin shipments on November 19th.